Trial in the case involving former President Rupiah Banda has commenced as the defence has objected to the production of a photocopy as evidence before the Lusaka Magistrate Court. This was after defence lawyer Professor Patrick Mvunga told Chief Resident Magistrate Joshua Banda that they had received instructions from Mr. Banda to proceed with trial even though he was not satisfied with the ruling on constitutional matters. The Prosecution led by Director of Public Prosecutions (DPP) Mutembo Nchito called their first witness a Police Officer by the name of Derrick Kasonka of Emmasdale Police Camp who narrated how he came across a letter purported to have been written by Rupiah Banda to late President Yaradua of Nigeria during a search at Former Minister of Energy Kenneth Konga’s house. After narrating, Kasonka wanted to produce the letter as his evidence. It was at this stage that defence lawyer Lubinda Linyama objected to the production of the letter saying it was a photocopy and the letter was also not classified secret as per normal State House letters. Mr. Linyama cited a number of authorities in the Zambia Law Reports as he objected to the production of the photocopy. In reply DPP Mutembo Nchito said the letter could be considered original because it was what was found at Konga’s house. Nchito also argued that the prosecution was going to call Konga to testify that the letter was found at his house. Nchito also said the original may have been sent to President Yaradua. The DPP’s response attracted reactions from Sakwiba Sikota who said the DPP was portraying a picture of a Cart before the Horse. He said the situation was supposed to be the horse before the Cart meaning that Konga was supposed to testify before the Police Officer. Mr. Sikota said even the argument that the original was sent to Yaradua was an assumption that should not be admitted in court. Professor Patrick Mvunga further told the court that it was legally wrong for DPP to say whatever document is found after a search should be treated as original. 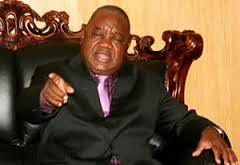 He challenged Mutembo Nchito to cite one authority to justify his claims. Lubinda Linyama also suggested that the photocopy could have been a draft. Magistrate Banda then adjourned the matter to Tuesday 23/04/13 at 09 hours for a ruling on whether the photocopy should be admitted as evidence by the prosecution’s first witness.